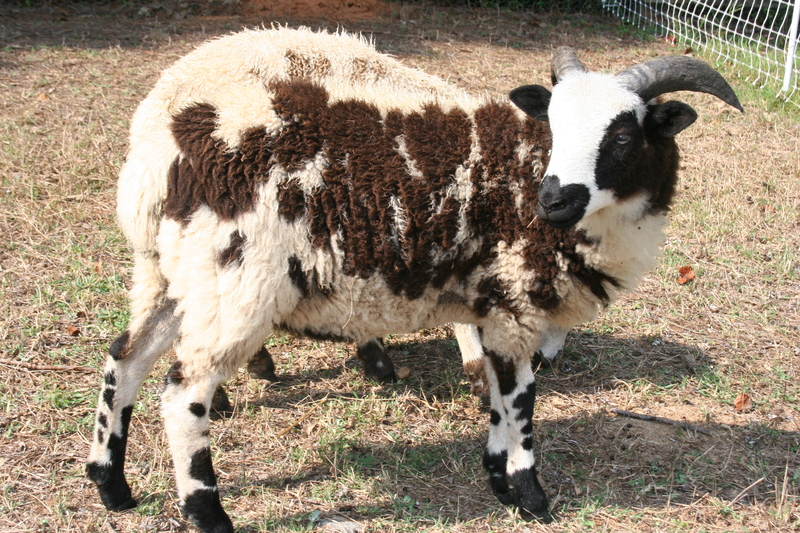 Tay-Sachs Carrier Jacob Sheep Breeding Program Benefit Raffle For 2012??? What are your thoughts, friends? I thought I’d repost last years raffle details and raffle items for those who didn’t happen across the raffle last year, and also as a reminder to those who participated. Many THANKS to those who supported the project. It was certainly a success and meant a lot to the folks involved with trying to find a cure for these children. In preparing to jump into this project again, I wanted to send out a TEST for interest. I want to ask, IS THERE INTEREST in another raffle. If so, do you have anything you’d love to donate to the raffle? Will you buy tickets to support this cause? Do I (Never Winter Farm) have a lamb you would love to see raffled? Which one? 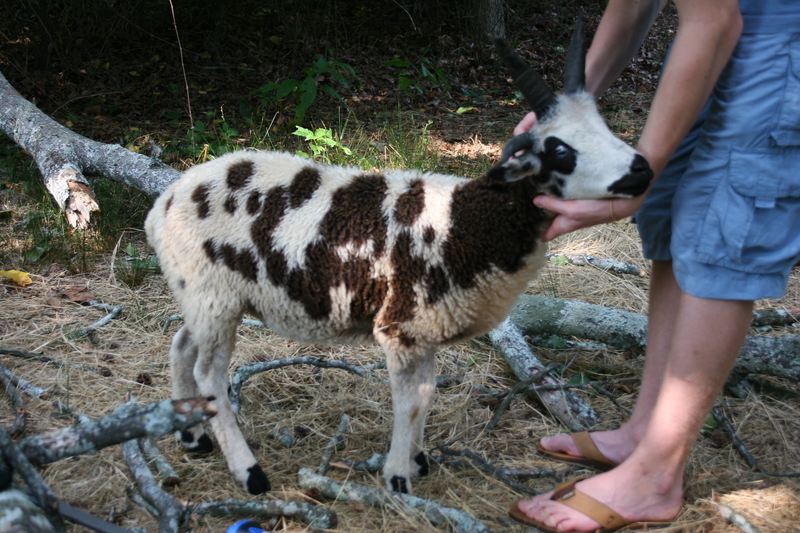 A ram lamb? 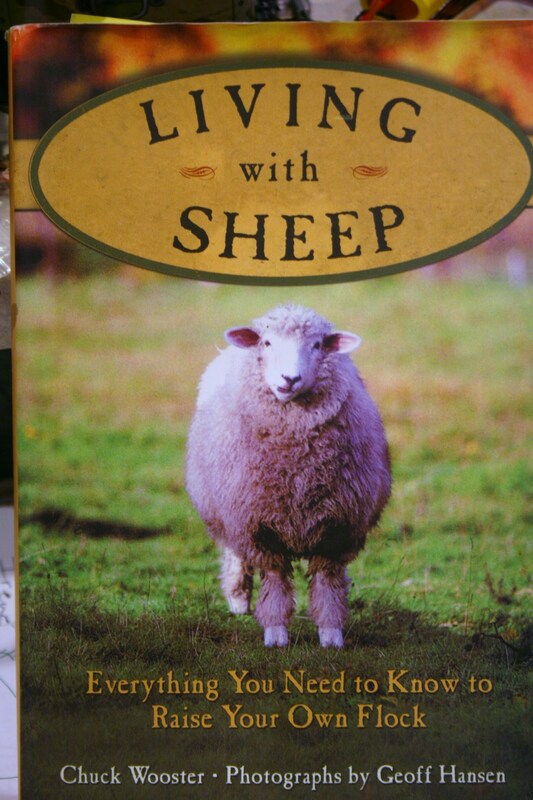 Ewe Lamb? Let me know? Any input that you could offer would be extremely helpful as I gear up!! So, Thanks! Lila (Blue Ewe Poppy X Painted Rock Oxford) Beautiful presence and you can’t see it, but she has more black on her backside. Her BLACK is very black. Pretty please send comments, thoughts, suggestions, donation offers, hopes, and prayers!! You can scroll down and COMMENT HERE on the blog, or you can privately email me at mikesharikids@yahoo.com. You are also welcome to phone my cell at 678-596-7776. Appreciate you all!!! Continue reading below to see all details from LAST SEASON! We had some amazing items! FOLLOWING IS A BRIEF PHOTO SUMMARY OF OUR RAFFLE ITEMS. FROM THE HOME PAGE OF THIS BLOG, PLEASE CLICK ON THE LINK TO THE RAFFLE PAGE FOR FURTHER DETAILS AND MANY MORE PHOTOS OF OUR ITEMS. TO GET TO THE HOME PAGE AT ANY TIME, YOU MAY CLICK ON THE “NEVER WINTER FARM AMERICAN JACOB SHEEP BLOG” TITLE HEADER (IN LARGE BLUE LETTERS AT THE TOP OF EVERY PAGE.) YOU MAY ALSO USE THE SEARCH FIELD IN THE RIGHT HAND COLUMN TO SEARCH AND FIND MORE INFORMATION ABOUT OUR FUNDRAISER AND ABOUT TAY-SACHS DISEASE ITSELF. GOOD LUCK!! 1. Scroll down and order by commenting on this blog post. Be sure to include your email address, the number of tickets, and which item or items you would like your tickets to go toward. 2. Email me at mikesharikids@yahoo.com. Be sure to include the number of tickets and which item or items you would like your tickets to go toward. 3. Call me at 678-596-7776. If you do not reach me, feel free to leave a message with how many tickets you would like and for which item/s as well as your email address. I will see that you get an invoice asap. *Once you comment here or email me, you will be invoiced for your tickets. Your invoice will include a breakdown of the number of tickets that you are purchasing for each item. Your invoice will be a paypal generated invoice and will reach you in your email. You may pay through paypal, or print the invoice and mail it with a check or money order. Thank you so much for your support! Good luck and please spread the word! 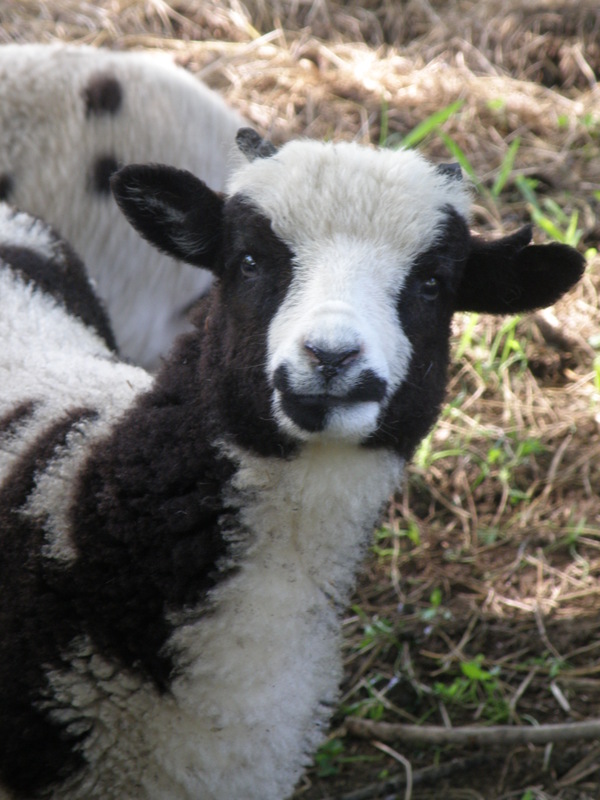 RAFFLE ITEM #1 – SHADOW MOUNTAIN ROSETTE – 2011 Lilac Ewe Lamb Donated by Mary Tonkin of Shadow Mountain Jacobs. Rosette comes with a complimentary health certificate and free delivery to Oregon, Washington, or the AGM. Rosette is sired by Mud Ranch Packard and her dam is Rocky Acres Rosemary. (DOB 1-28-2011.) More details at SHADOW MOUNTAIN JACOBS. This beautiful ewe lamb was to be Mary’s keeper lamb this year. The story of the Tay-Sachs children touched her so much that she decided to donate Rosette to help the cause. Thank you Mary! 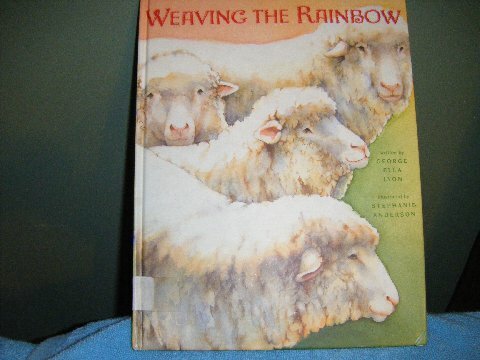 RAFFLE ITEM#2 – WEAVING THE RAINBOW BOOK By George Ella Lyon and Stephanie Anderson. 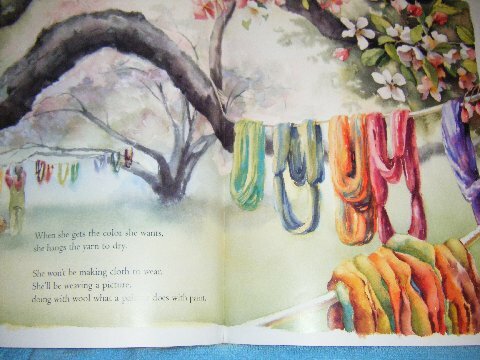 Weaving The Rainbow is a stunningly beautiful book that has been donated by Sharon Lehrke and Sovreign Farms in Myakka City, Florida. 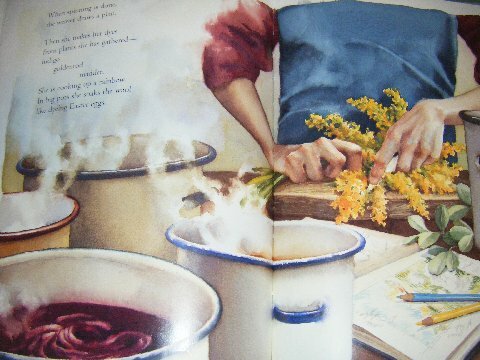 The artwork in this out of print picture book (former library book that is in pristine condition) is nothing short of breathtaking. Thanks again to Sharon for being willing to “give up” this unique treasure from your own private collection of priceless finds! Visit Sharon at Sovreign Farms. 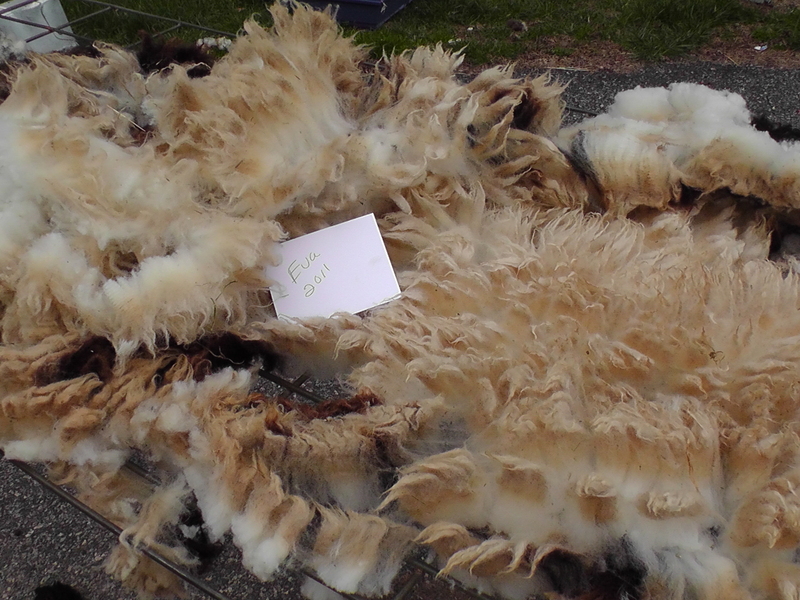 Elizabeth Strum of Rockhaven Farm has donated this beautiful washable Jacob Sheep Pelt. 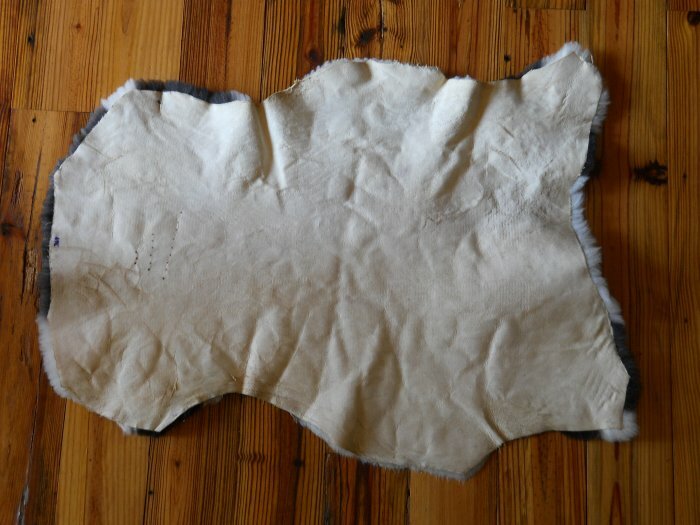 Pelts make wonderful decorative items, wheel chair and bed pads, rugs, dog beds, and car seat pads for children and adults alike. 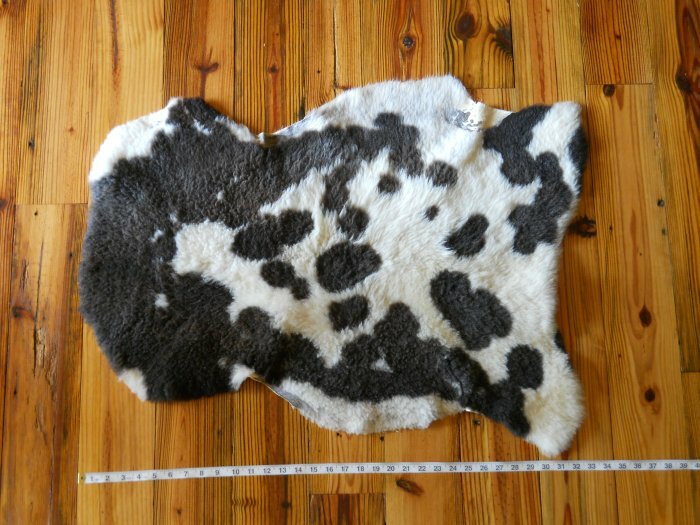 This pelt is approximately 32″ X 22″ and has a lovely spotting pattern. A pelt of this size retails for somewhere between $90-$150. 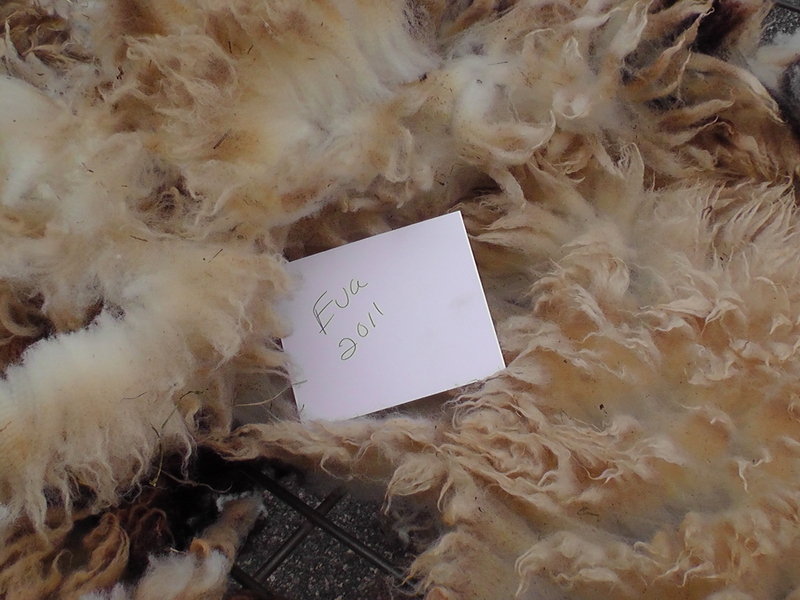 This pelt has been professionally tanned and is soft and supple. (Photos do not do justice to this piece.) In addition, it is washable and will come with full care instructions. Thank you Elizabeth! 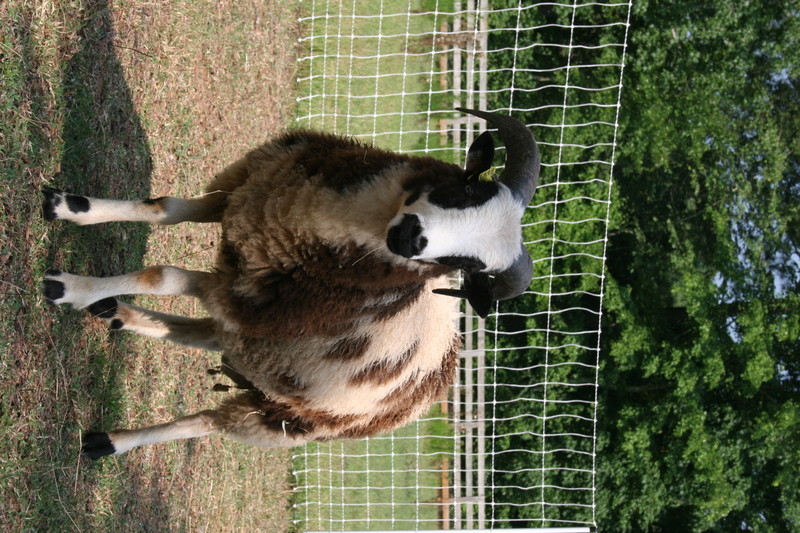 Visit Elizabeth and her flock at ROCKHAVEN FARM. 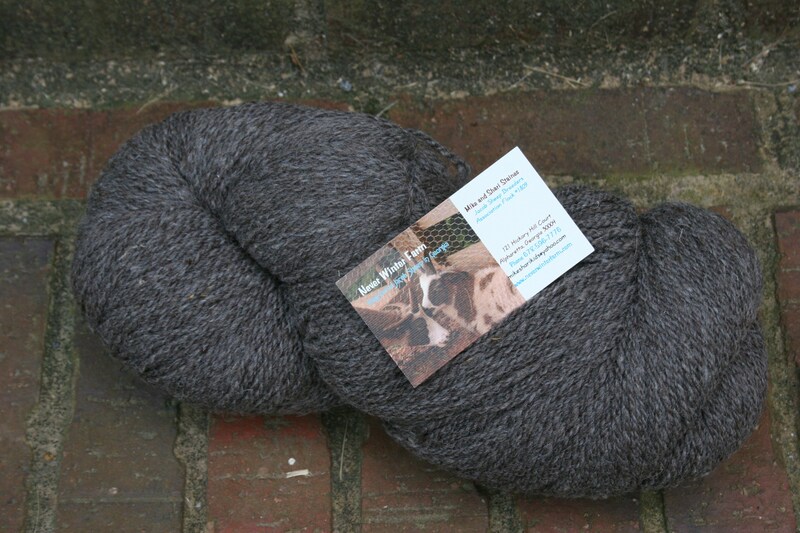 This is 15.2 ounces of Jacob Wool Yarn. I had this spun up by Spinderellas and they did a beautiful job! The tag on this says 270 yards 4 skeins. It is a lot of yarn! This wool was harvested from Painted Rock Kingsley. 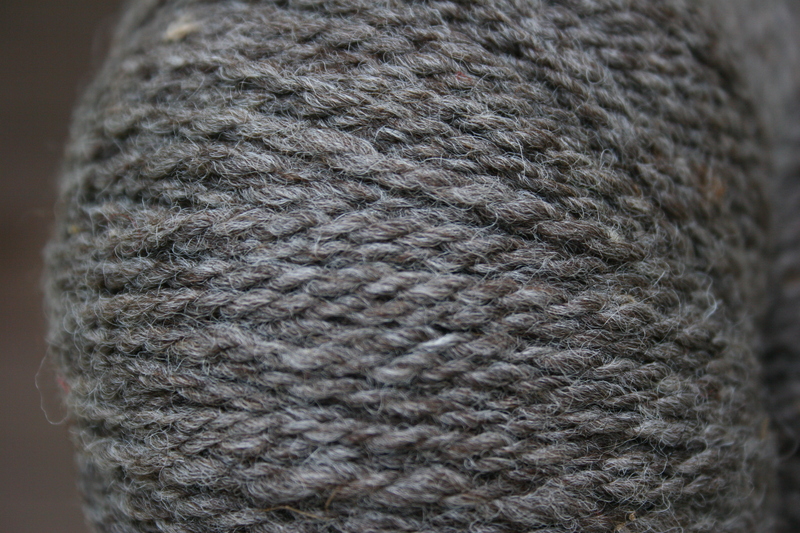 His fleece is amazingly soft and I think you’ll find this yarn to be remarkably soft as well. 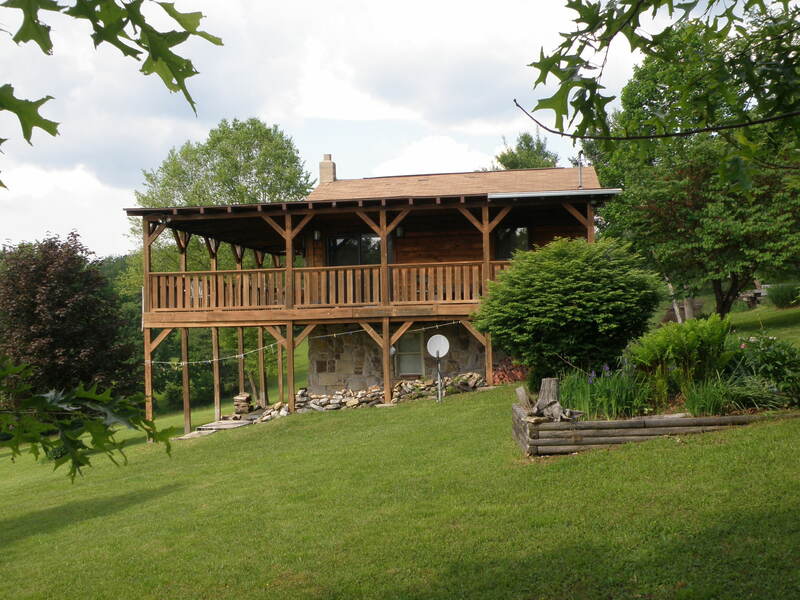 RAFFLE ITEM #5 – RICH MOUNTAIN RETREAT WEST VIRGINIA CABIN WEEKEND GETAWAY!!!! This is amazing! 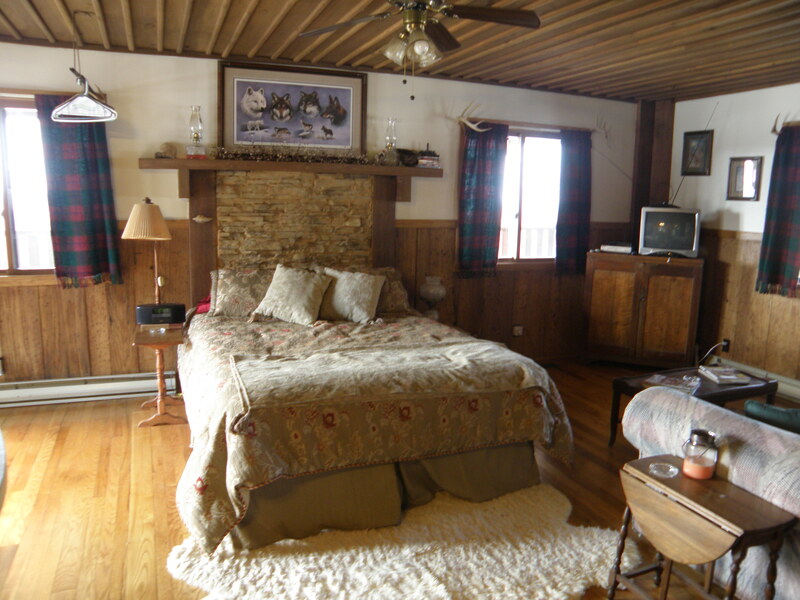 Cheryl and Mike Terrano of Painted Rock Farm have offered up a weekend at their cabin for our raffle! Folks, you can drive over to Painted Rock Farm and see the sheep!!!! The Rich Mountain Retreat is ideal for weekend getaways, honeymooners or anyone wanting a break from the daily grind! 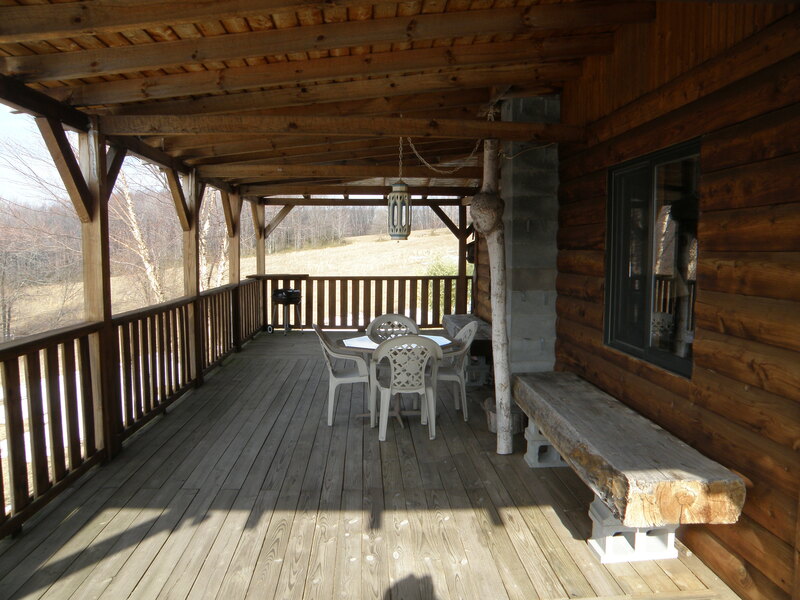 Enjoy watching deer and wild turkey as you relax on the 10 foot porch that surrounds the cabin. Nearby hiking and walking trails provide a look into Battlefield history during Civil War times. You can spend the day walking thru camp sites, such as Camp Garrett. Re-enactments of the Battle of Rich Mountain occur each summer ~ ask about details! Visit Mike and Cheryl Terrano and the fabulous Painted Rock Flock at PAINTED ROCK FARM. 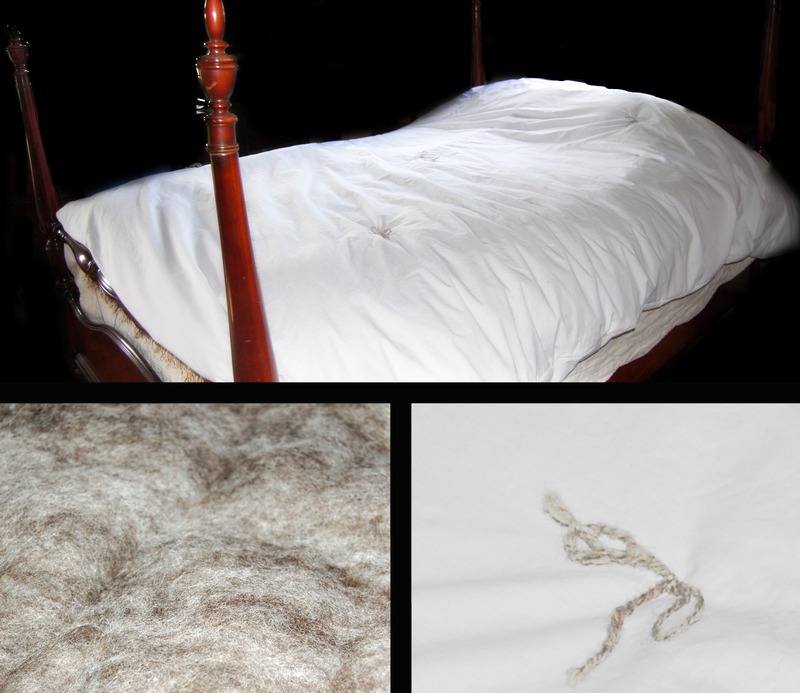 Our next raffle item is a beautiful raw Jacob fleece that has been donated by our wonderful friends and fellow Jacob Sheep breeders Jeff and Mary Margaret Mauer at Deerfield Ranch. This is Deerfield Evangeline’s hogget fleece (which means this is the fleece from her first shearing.) Eva’s fleece is lovely. 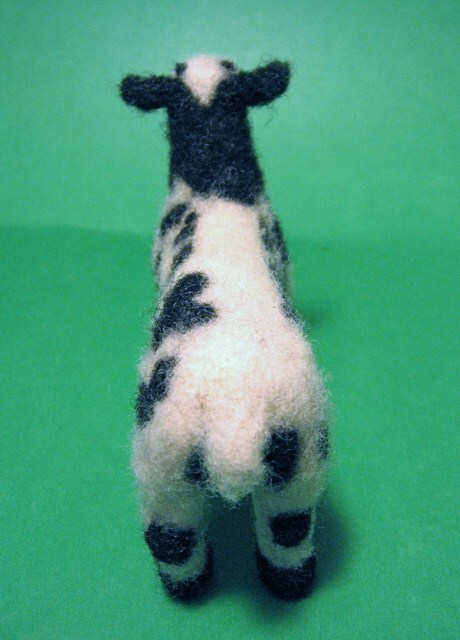 She has a fine fleece that is soft with a nice lofty feel to it. Her fleece is mostly white with approx. 5-10% black spots so will be very easy to sort and fabulous to use for a natural colored project or superb for dying. Thank you to the Mauer Family at Deerfield Ranch! Fiber enthusiasts….PLEASE spread the word about our raffle! Send your friends our way! Please share the link to our blog with your fiber groups! We need all of the support that we can get. This is such a great cause! 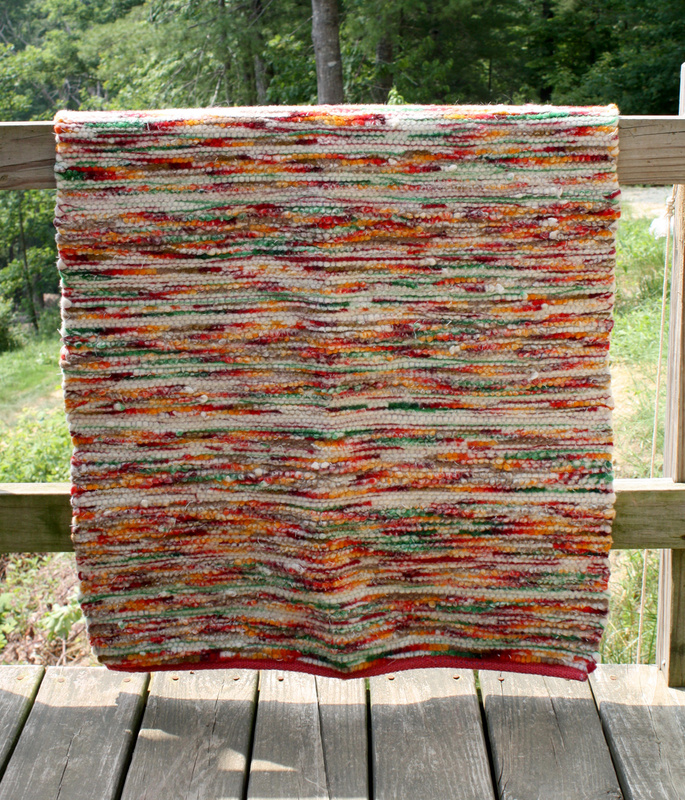 This is a drop dead gorgeous, and full of vibrant colors, handmade rug by Linda Bjarkman at Patchwork Farm. 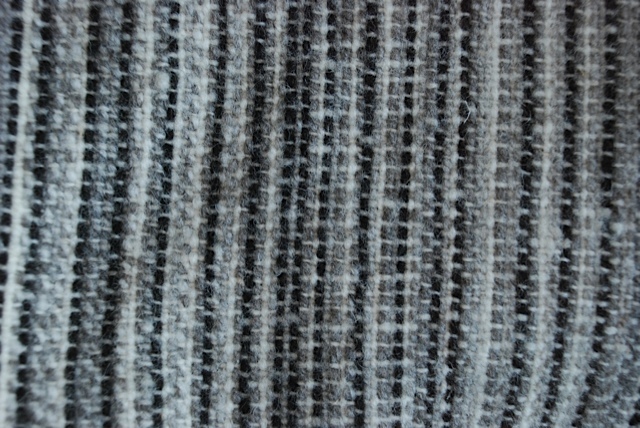 The weft is wool selvedges from Pendleton Mills. Woven on a cotton warp. Thank you so very much to Linda and Dave Bjarkman! 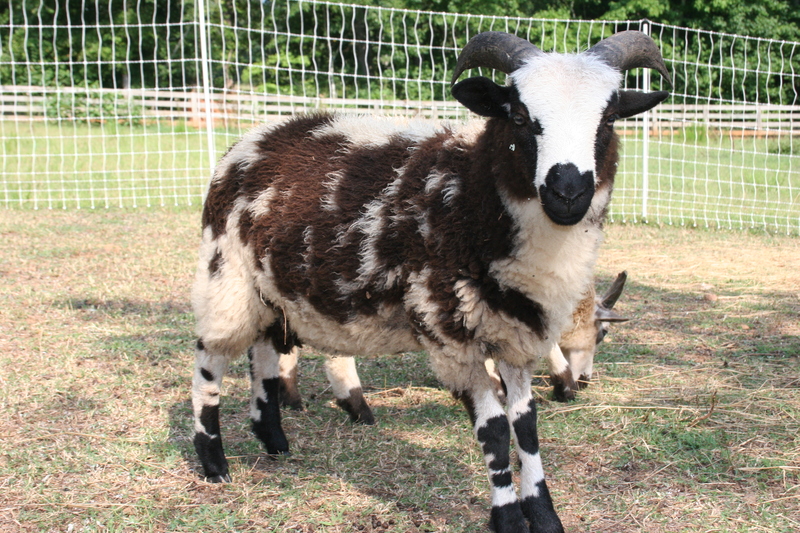 You may visit Linda and Dave and their beautiful Jacob Sheep flock at PATCHWORK FARM. Just when I thought that it couldn’t possibly get any more exciting folks!!!!!!! Check this out!!! 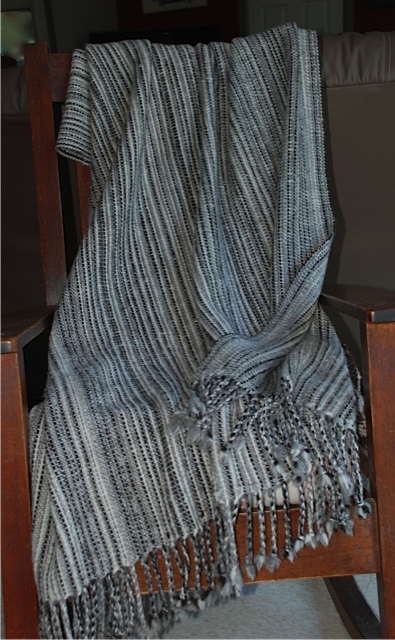 Raffle item #9 is a stunning blanket that has been donated by Robin Lynde and Meridian Jacob Sheep. Read on for more details!! Robin Lynde, of Meridian Jacobs in Vacaville, California, weaves a variety of unique pieces from the wool her sheep grow. 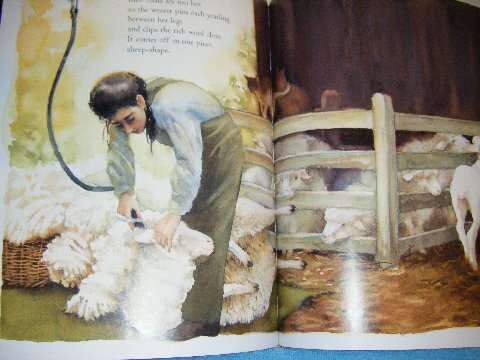 Robin selects her sheep for top quality, soft fiber and uses only the best for producing her yarns. 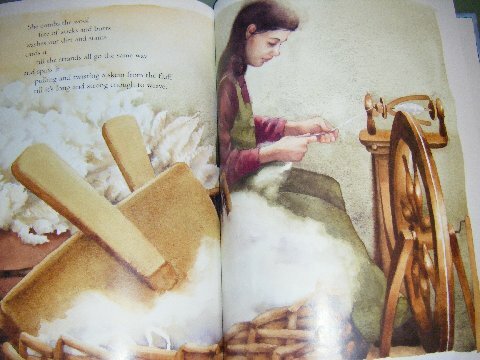 She carefully selects and sorts the wool to be sent to the mill for spinning, creating unique yarns from each year’s wool crop. 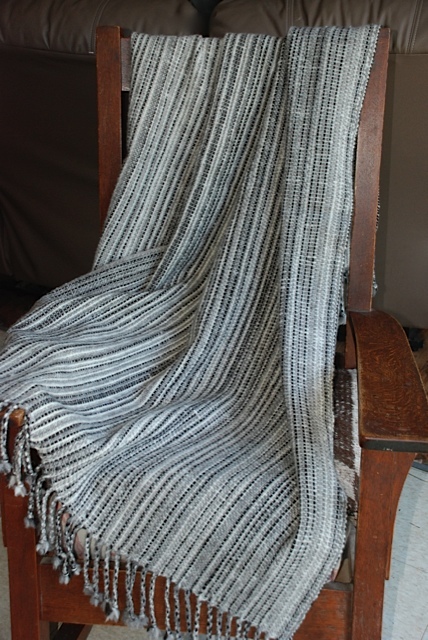 Robin weaves blankets on a 60″ wide 16-shaft AVL dobby loom. 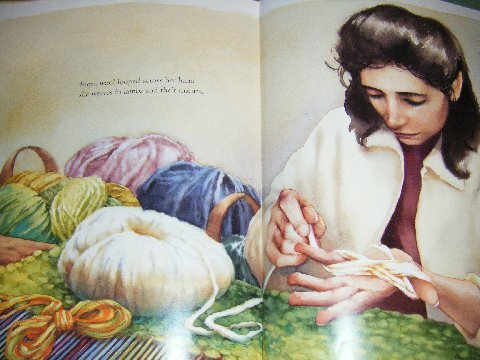 She wove this blanket using yarns in all the natural colors of the Jacob sheep. It is 46″ X 67″ plus a 5″ twisted fringe. Retail Value: $350.00. 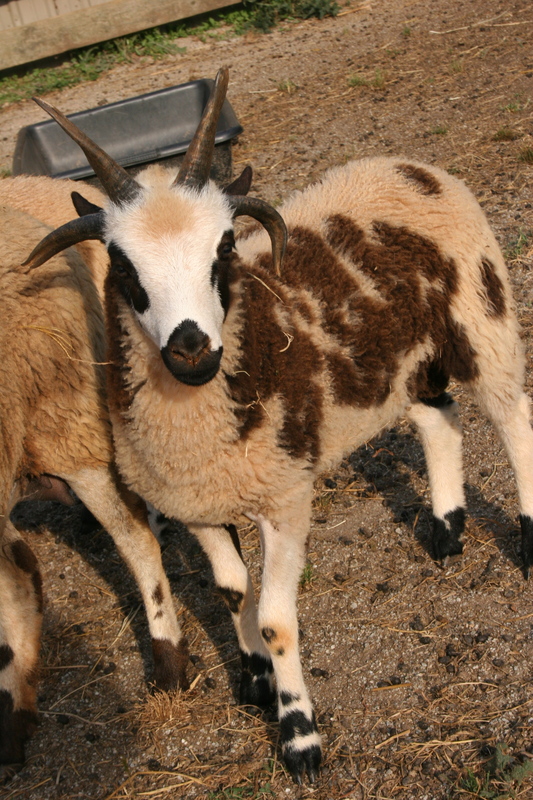 Meridian Jacobs is home to a breeding flock of about 65 Jacob sheep, but it is also a full-service fiber business, stocking spinning and weaving equipment, farm-produced and commercial yarns, Robin’s handwoven pieces, and gift items. Robin teaches classes in weaving, spinning, and dyeing and hosts Open House events three times per year. 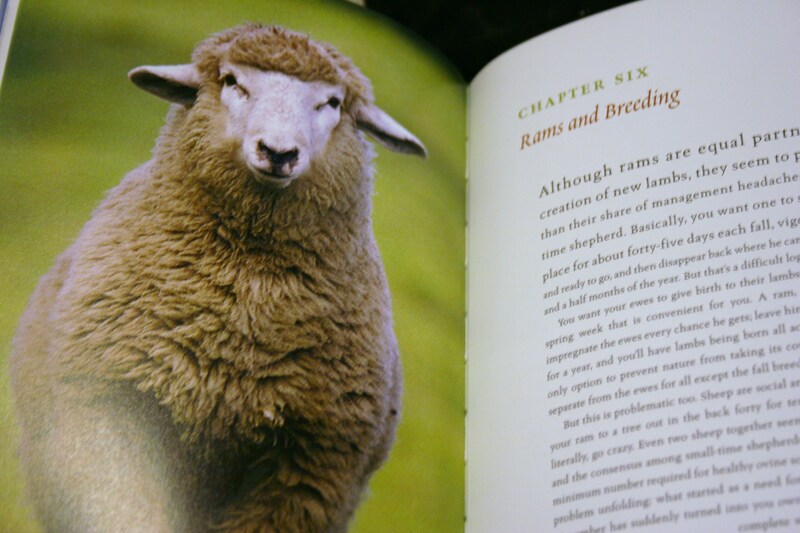 She created the popular Farm Club for people who want to know more about what it takes to raise sheep and produce fiber. Robin’s pieces are for sale at The Artery in Davis, California and on her website at MERIDIAN JACOBS. Thank you Robin for the BEAUTIFUL donation!!! NEVER WINTER DASHING! Dashing is a lilac carrier via his sire Moses. He has a strong 4 horn background and a 4 horn twin. Questions welcome via private email or go ahead and comment here. Transportation to SAFF and health certificate are included. (G444R -/-). 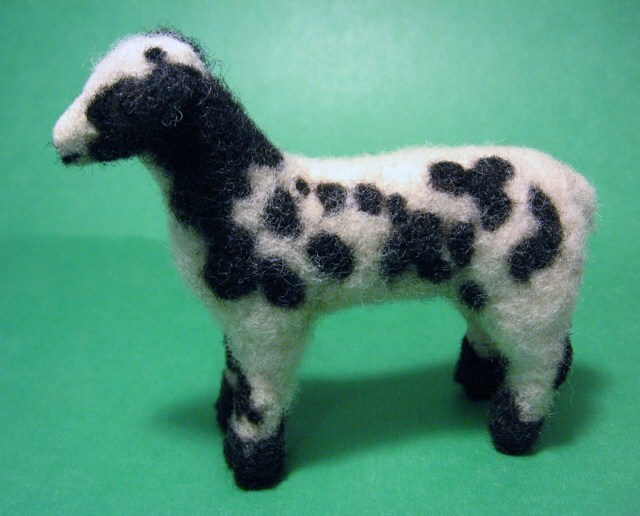 “This is a portrait of a special Jacob Sheep Lamb, Elise. 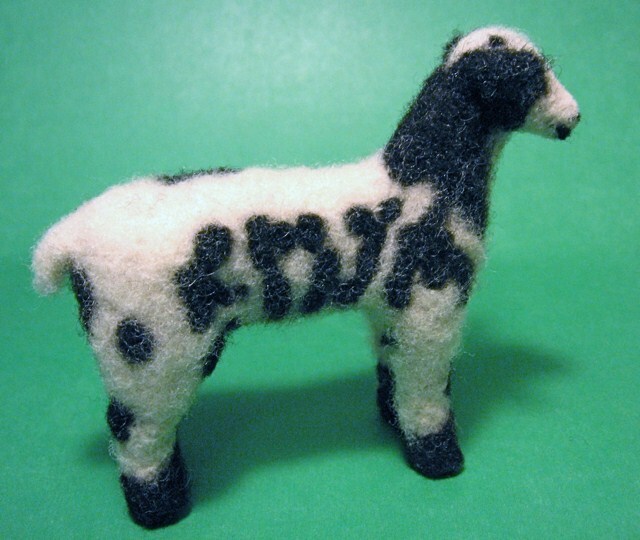 This sculpture was created out of 100% homegrown wool using the needle felting technique. 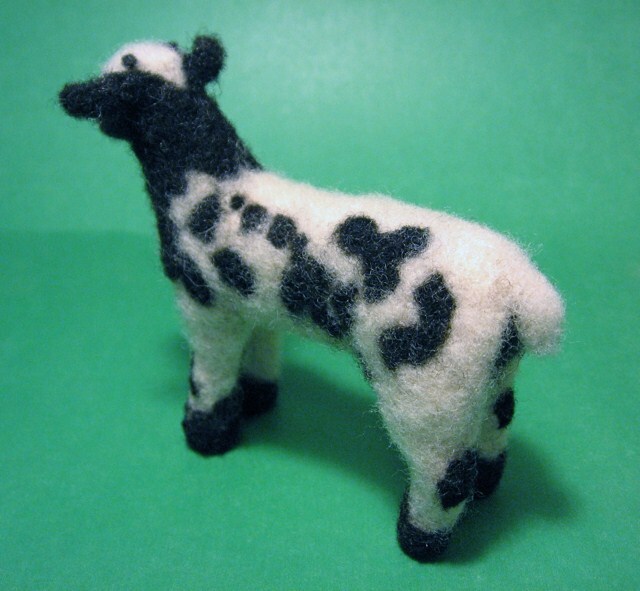 The core and basic shape were sculpted from Suffolk wool from my father-in-law’s flock. 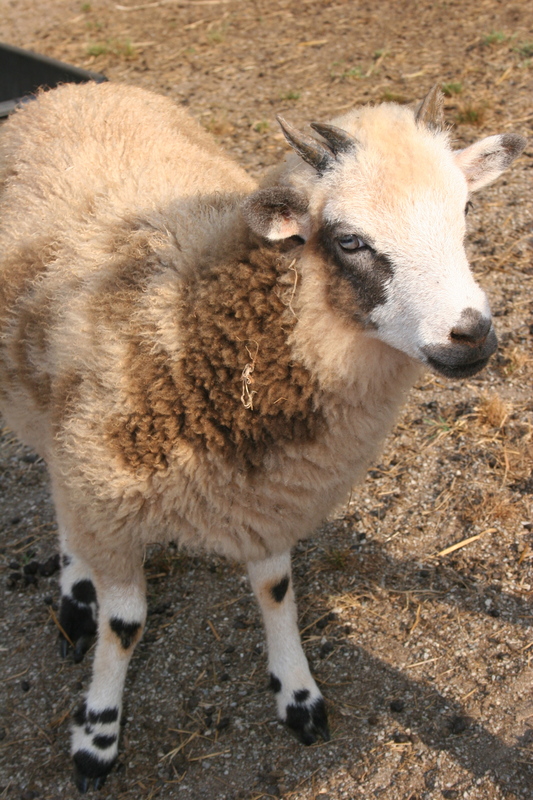 The wool for the exterior details and coloring was provided by my Jacob Sheep ram, Jericho. The process took around 10 or so hours. She is 4″ tall and 4.5″ long. I was honored to create this likeness of Elise for the raffle.” Visit Laura at FARM GIRL ARTS. 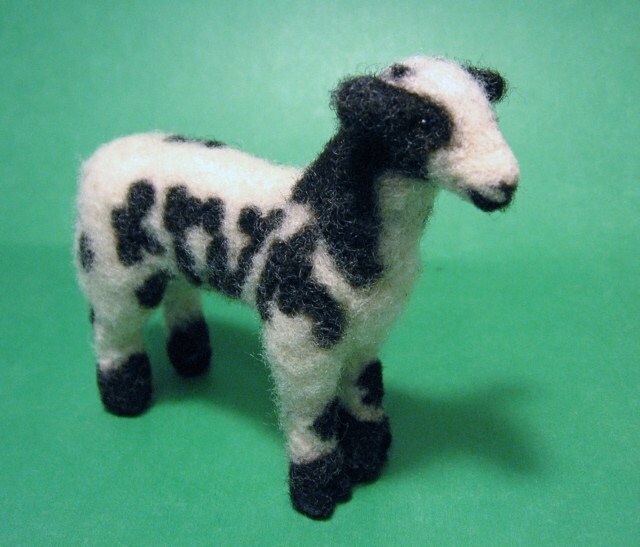 Choosing a lamb model for the raffle was quite simple. 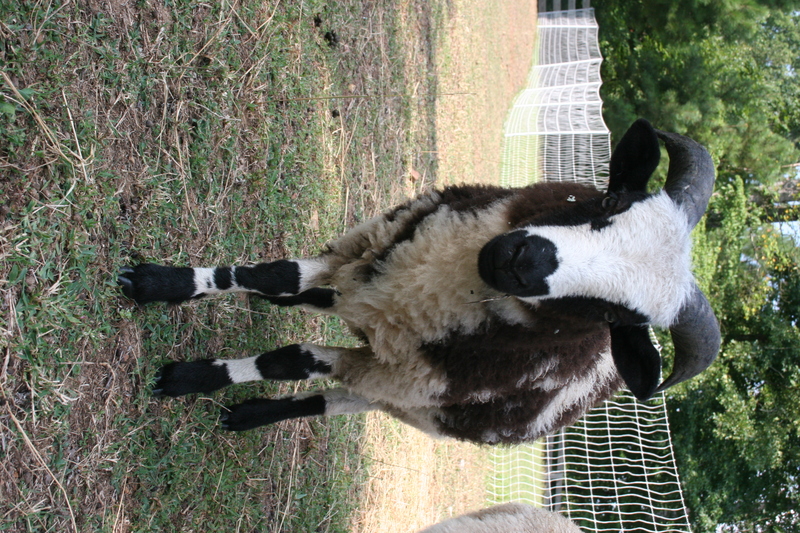 Elise is a very special ewe and has stood out since the moment her little hooves hit the ground. 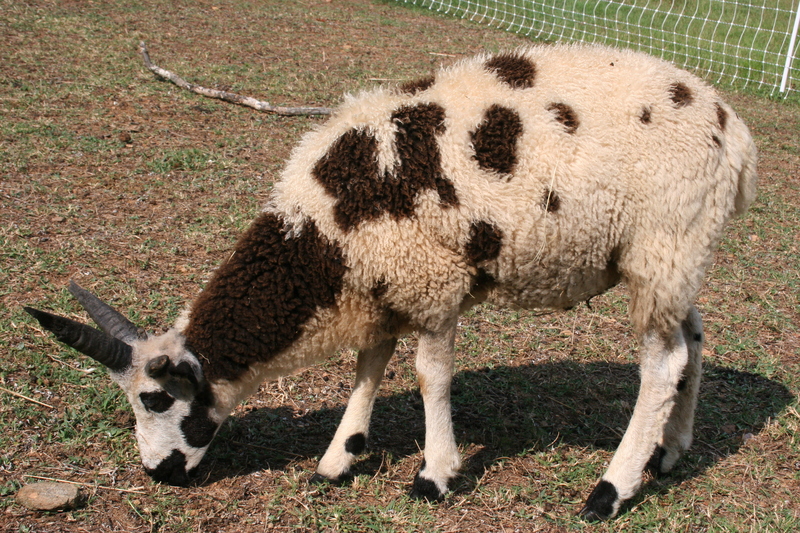 Her markings are just exceptional, lots of color and splash make it easy to see her in the flock. 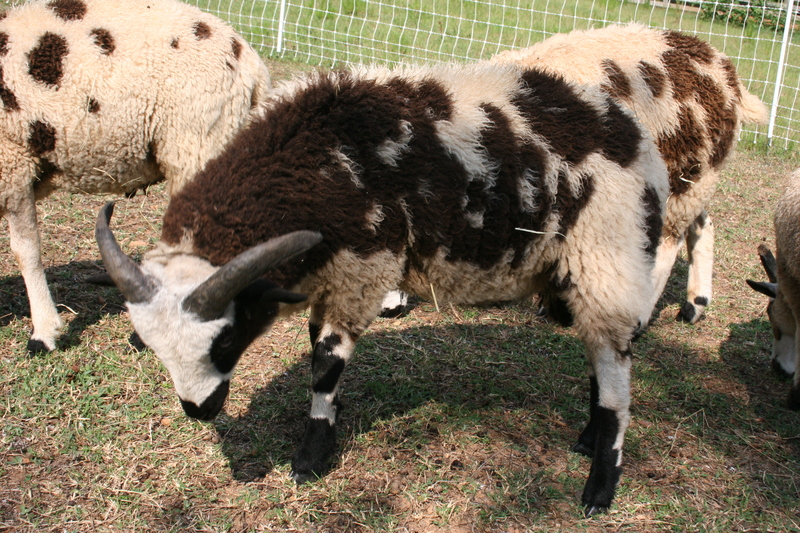 Her fleece looks very promising, sporting even crimp and deep black color. Elise is just a precious, bubbly little lamb with the cutest nose ever! 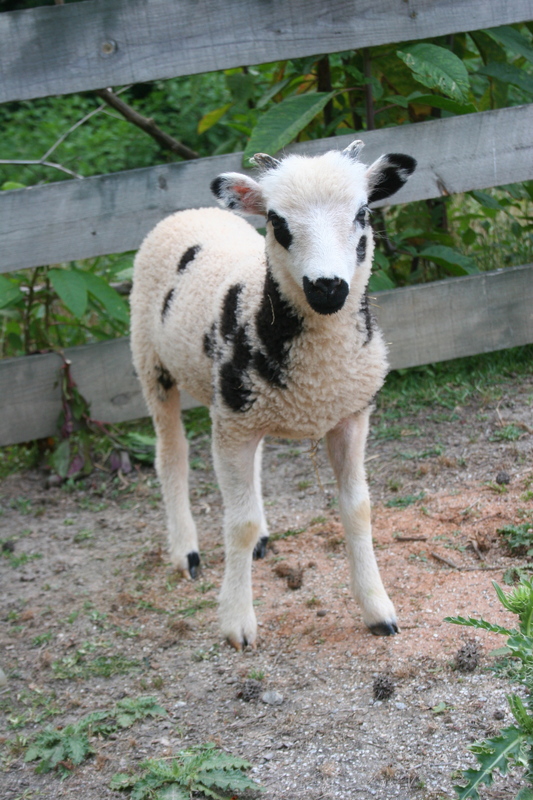 This lamb was named in honor of Elise Rochman from O’fallon, Illinois. She is one of many children and families that have been affected by Tay-Sach’s Disease. You can read Elise’s story on the Cure Tay-Sach’s Foundation web site or click here. Sadly, little Elise lost her battle against Tay Sach’s in January of this year. She was barely six years old. Elise’s parents won’t see their little girl play with dolls or go to school for the first time. They won’t have slumber parties or teach her how to drive or see her off to her first prom. They won’t get to see her graduate high school or help plan her wedding. So much promise in that little life, cut short by a disease that currently has no cure. 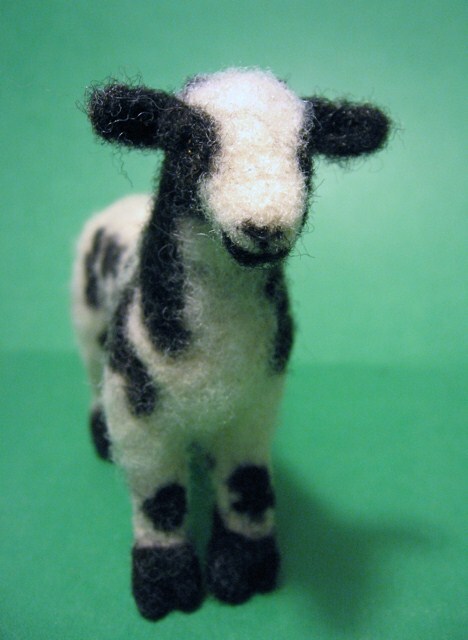 Elise the lamb also is affected by Tay-Sach’s . Her shepherd will not see her grow into the promise of what was envisioned for her either. And, while it pales in comparison to the loss of ‘real’ Elise, it is a loss nonetheless and still felt deeply by her Shepherd. 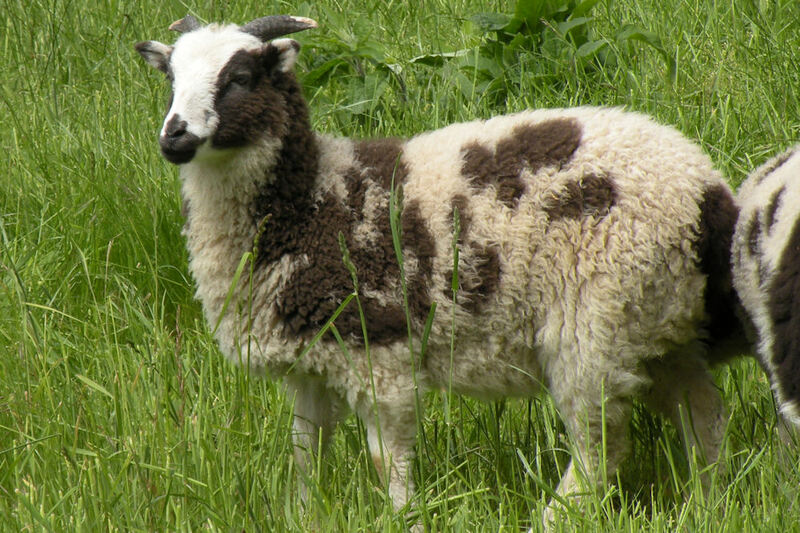 The main purpose for this fundraiser is to raise awareness of Tay-Sach’s and to provide information about the important role of the Jacob sheep in finding a cure. 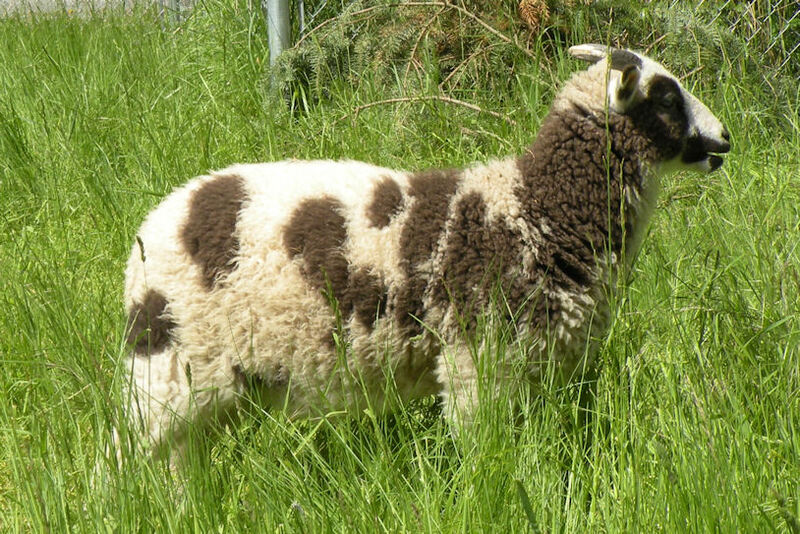 It is believed by many in the research community that the Jacob sheep may well hold the cure for Tay-Sach’s disease in humans. A handful of shepherds in the US have opted to join hands with the scientific research team in this effort. These brave individuals have looked into the reality of human loss and suffering, knowing they could not stand by and do nothing. They should be commended for this indeed is labor of love ~ a love for children and families. While they may never meet face to face, they are bound together by hope in the search for the cure. On behalf of Tay-Sach’s children and their families everywhere, Elise the lamb is proud to carry the name and legacy of Elise Rochman. 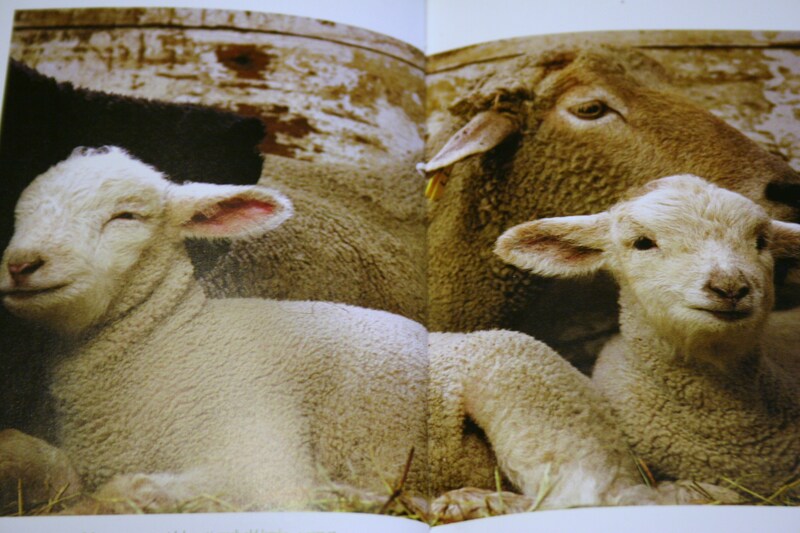 RAFFLE ITEM #12 – BEAUTIFUL QUILT WITH JACOB SHEEP BATTING. Cheryl Bresin has been busy creating something very special for this fundraiser. She finished this beautiful quilt just today! It was certainly worth the wait and I am thrilled that she was kind enough to donate this true labor of love! Thank you so very much Cheryl! It means so much! This is a queen sized quilt. It is displayed on a double bed. The batting was professionally milled. 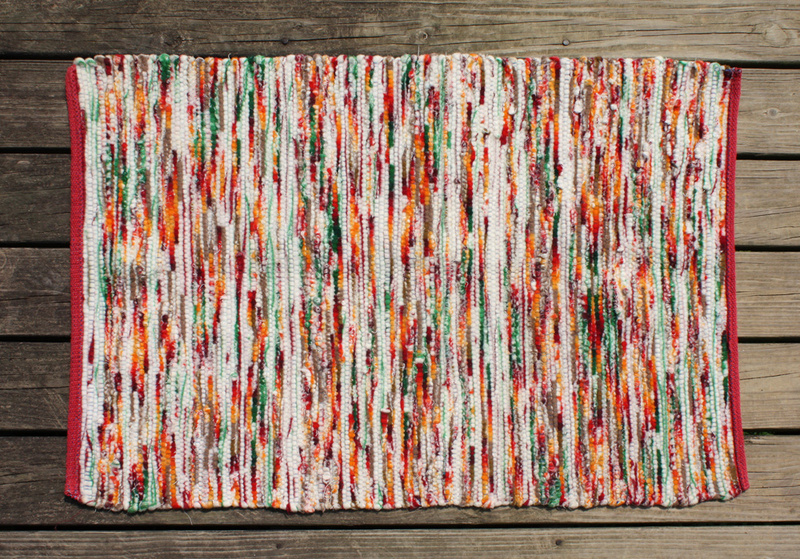 It is covered in a cotton blend material and is hand quilted with hand spun Jacob yarn. It will be sent UPS with washing instructions. Here is how the raffle will work:Tickets will be on sale from now until August 14th 21st at 12:01 AM EST. So, ticket sales are over at midnight on that previous Saturday night. (August 13th 20th @ Midnight EST.) At that time, sales will close and late tickets will be completed and added to the raffle containers for each respective item. All raffle tickets and containers are being handled off site from my farm by a neutral party and that family is NOT allowed to purchase ANY raffle tickets. (You will meet them during the drawings.) Just so that everyone knows….no one in MY immediate family is elligible to purchase raffle tickets. (I want to keep this 100% legit and fair.) On Sunday, August 14th 21st , drawings will be held off site and videotaped for YOU ALL to see. It will be my goal to have the videotape of the drawings uploaded to Youtube on August 15th 22nd (Monday) with the Youtube link published on my farm blog. This way, everyone who has participated may follow the link and view the drawings and see who the winners are! Hopefully, it will be YOU! 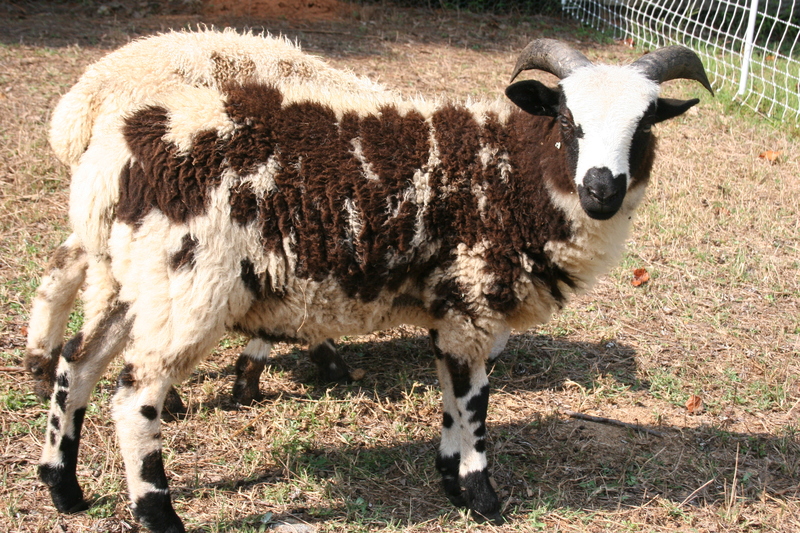 100% of all ticket sales will go directly to the Tay-Sachs Carrier Jacob Sheep Breeding Program. If we are blessed enough to raise more money than the breeding program requires at this time, surplus funds will go to the Cure Tay-Sachs Foundation. Either way, your ticket purchase will go 100% toward helping to find a cure for these children. Thank you so much for helping! *You may buy a large volume of tickets for any ONE item. Or, you may decide to split your tickets on several of the items. Just be sure to tell us what you’d like for us to do with your tickets. Folks, even if you can only purchase one ticket, every little bit helps and you have done your part in helping find the cure. We appreciate every single ticket purchase more than you know. The more people that participate, the more positive energy that we can create to fuel this cause and push toward the cure! This is so exciting!! *Note – Shipping via UPS or USPS will be paid for in the continental US by fundraiser proceeds for all items excluding the lambs and weekend getaway. Stay Tuned for Winners Tomorrow!!! This has been a crazy weekend at Never Winter Farm. Just a busy crazy life with kids and sheep kinda weekend. As you probably know, the tickets were handled (until today) off-site at the Youngblood Family’s farm. Due to scheduling conflicts today, and kid’s bedtimes, we ended up with David Youngblood delivering the tickets back here to Never Winter Farm today. I had to recruit my wonderful husband, Mike, to coordinate the actual drawings. Mike, with my 12 yr old (Zach) behind the camera, coupled with Blake (our ten yr old) did a great job! You will see the results of their “video” tomorrow once it is edited (with some bloopers) and uploaded to youtube. I will hope for NO TECHNICAL DIFFICULTIES. So…..now that I know the winners I CANNOT WAIT to get the news out to everyone! Please be patient as we put finishing touches on our announcement. See you back here soon. Have a wonderful night everyone! FINAL DAY FOR RAFFLE IS TODAY!!!!! I want to thank everyone who has come through to help with raising needed funds and awareness for our Tay-Sachs breeders and for these children and their families!!! THANK YOU!!!! For those who have not purchased tickets yet, you can still make the deadline. Simply contact me via phone or email (or comment here) prior to the midnight cutoff TONIGHT! That’s correct, the raffle will be OVER as the clock strikes TWELVE MIDNIGHT TONIGHT!!! You can still make the order cutoff and join together with us as we ARE HELPING THESE KIDS! Fundraiser Ticket Sales Extended By One Week – Purchase Your Tickets Through August 20th!! 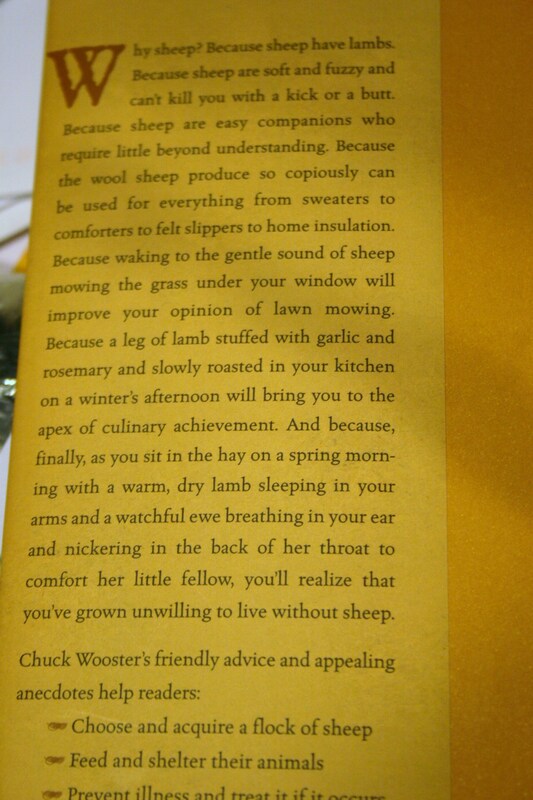 An additional note for ticket holders and interested parties regarding the ram lamb item, Dashing! I am going to sweeten the pot a bit! 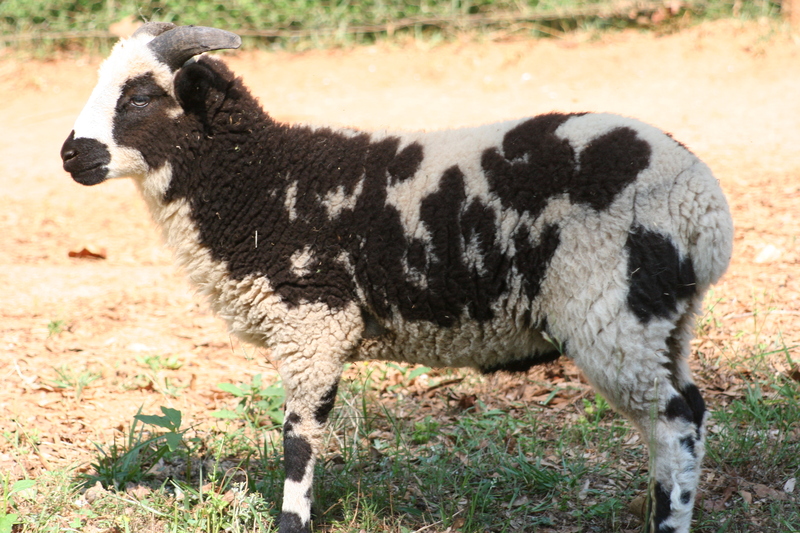 You will now have a choice between three 2011 ram lambs! See my farm website at www.neverwinterfarm.com. 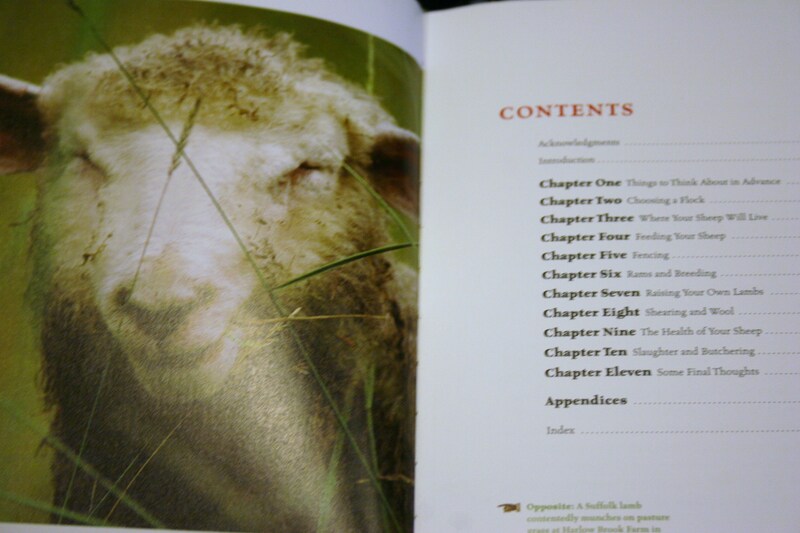 If you win the ram lamb, you may decide to take DASHING, GALORE, or HAUK. Your preference! If you need further info. such as pedigree details on either one of these rams, just give me a call or shoot me an email. Updated Photos of Raffle Ram Lamb and others…..
To purchase tickets to WIN DASHING, please see our Raffle Fundraiser Page!! The above photos of Dashing were taken 7/26/2011. Never Winter Galore - A Shadrach son out of Spahr Farm Darlene - FOR SALE! Amazing fleece on Galore! See my website for more information. WE HAVE ADDED A THIRTEENTH RAFFLE ITEM! 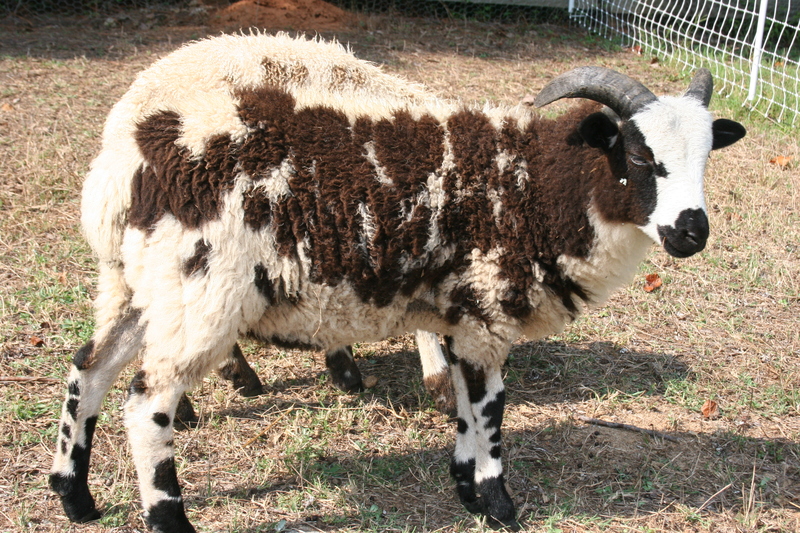 – Tay-Sachs Carrier Jacob Sheep Breeding Program Benefit Raffle Open Through Saturday August 13th!!! FUNDRAISER IS OPEN FOR BUSINESS! 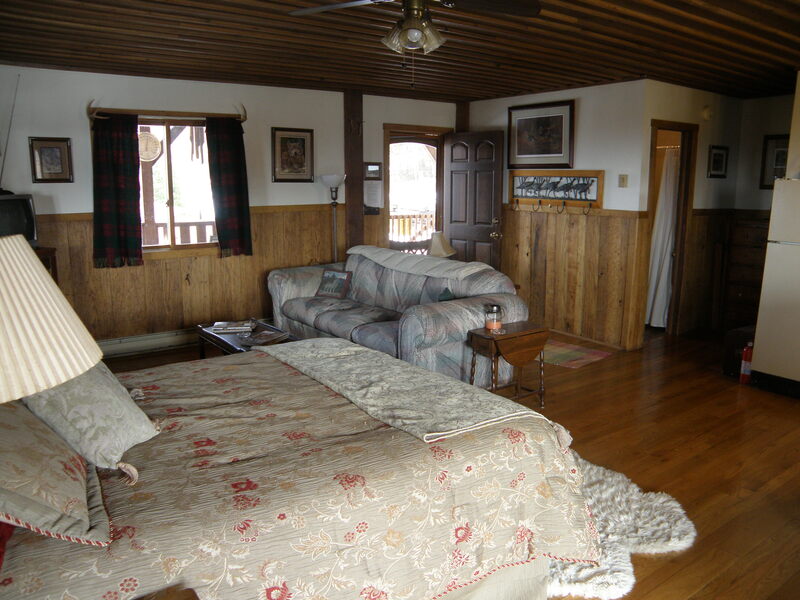 Our cabin is remotely located atop Rich Mountain Battlefield in Randolph County, West Virginia. 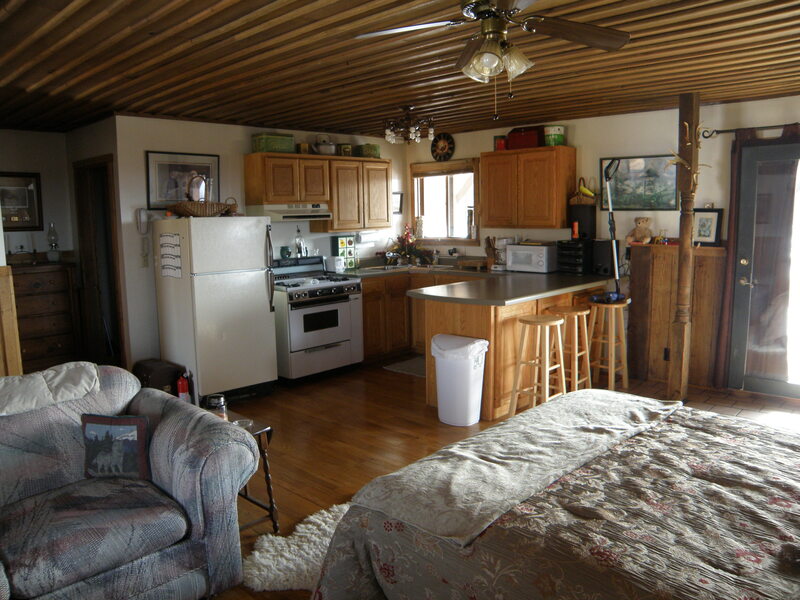 If you want privacy and seclusion, this is the place!The upper (main) level of our cabin hosts an open floor plan. Sleeper sofa and queen sized bed are on this level, along with the bathroom, living area and fully equipped kitchen. The lower (basement) level has 3 twin beds, plus dresser storage. All linens (bed sheets and towels) are provided ~ we suggest you bring your own pillow! He has lots of flash and nice color retention. We are pleased to add another raffle item donated by Fred and Joan Horak of St. Jude’s Farm in Lucas, Texas. 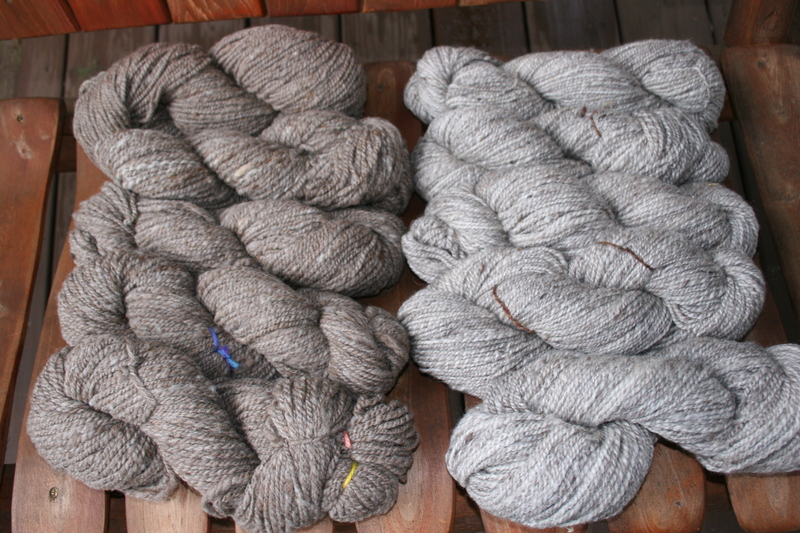 This is TEN skeins of Luxurious Handspun Jacob Wool Yarn in two natural shades. Enough for a large project! Very soft and just beautiful. Thank you Fred and Joan. Good luck everyone! Here is how the raffle will work:Tickets will be on sale from now until August 14th at 12:01 AM EST. So, ticket sales are over at midnight on that previous Saturday night. (August 13th @ Midnight EST.) At that time, sales will close and late tickets will be completed and added to the raffle containers for each respective item. All raffle tickets and containers are being handled off site from my farm by a neutral party and that family is NOT allowed to purchase ANY raffle tickets. (You will meet them during the drawings.) Just so that everyone knows….no one in MY immediate family is elligible to purchase raffle tickets. (I want to keep this 100% legit and fair.) On Sunday, August 14th , drawings will be held off site and videotaped for YOU ALL to see. It will be my goal to have the videotape of the drawings uploaded to Youtube on August 15th (Monday) with the Youtube link published on my farm blog. This way, everyone who has participated may follow the link and view the drawings and see who the winners are! Hopefully, it will be YOU! You may scroll down this lengthy post to review the details of last season. Pretty please send comments, thoughts, suggestions, donation offers, hopes, and prayers!! Appreciate you all!!! 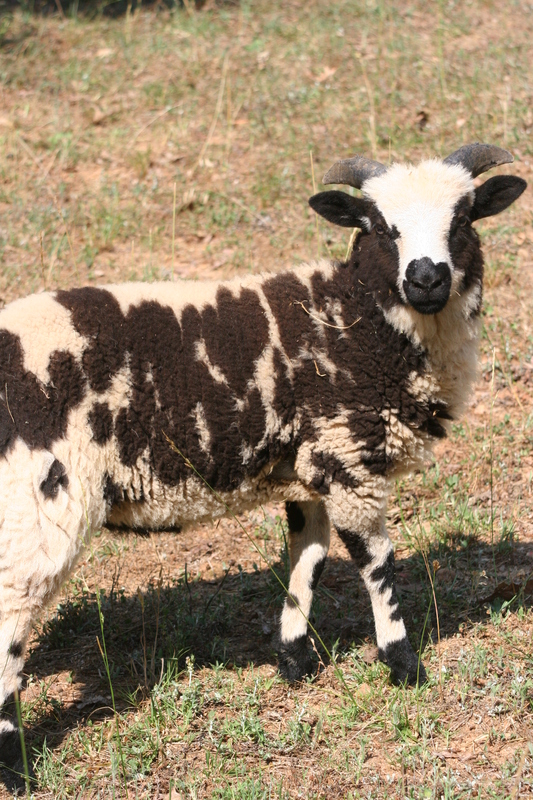 RAFFLE PAGE – Tay-Sachs Carrier Jacob Sheep Breeding Program Benefit Raffle EXTENDED AN ADDITIONAL WEEK Through Saturday August 20th!!! Calcium Gluconate 23% Solution. My New Best Friend! Freedom Update. 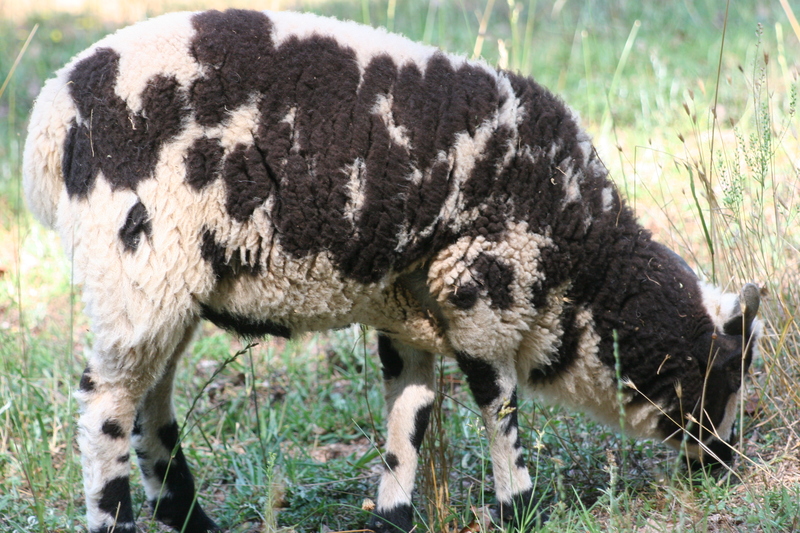 . .
How many teats does a Jacob Sheep ewe have?